Before 1944, most of the female PHS personnel wore civilian work clothes at their job. 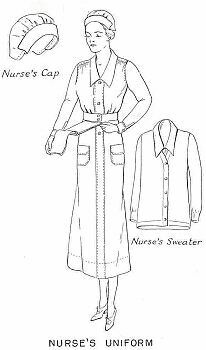 Only PHS nurses had a special indoor uniform consisting of a ward dress with nurse's cap. For extra warmth a sweater could be added. 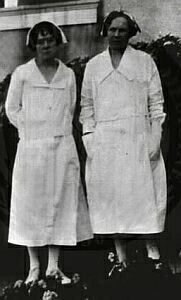 The nurse's white uniform was also worn by dietitians and nurse's aids. PHS Nurse's Working Uniform . 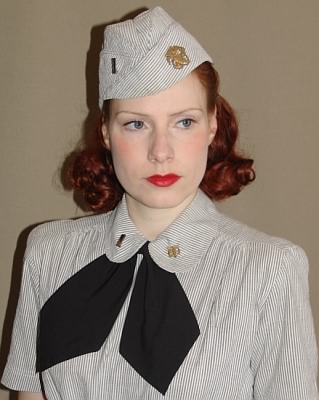 Following civilian fashion, the original length of the white uniform (as shown in the pictures above) was shortened to 12 inches from the floor to the hem of the skirt at the begin of 1941. Shelby L. Stanton ..v Outside the hospital, a navy blue cape made of all wool broadcloth with maroon flannel lining and a matching navy blue beret with maroon piping could be worn. 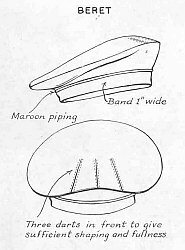 The beret had a special design as illustrated in the drawing on the left side.
. In 1944, the working uniform of the SPARS was adopted for all female PHS personnel belonging to the commissioned corps. 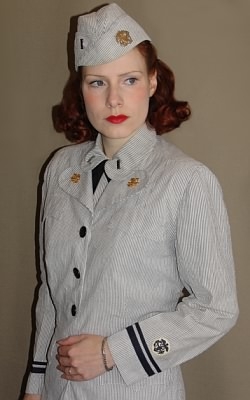 This working uniform consisted of a gray and white striped one-piece seersucker dress with matching jacket and garrison cap. Seersucker dress worn with matching garrison cap. Note the small PHS collar insignia worn on the left collar and miniature pin-on rank insignia worn on the right collar. Seersucker dress worn with matching jacket.